In Asia, Japan -2%. Hong Kong -0.16%. China closed. India -1.14%. In Europe, at midday, London +0.15%. Paris +0.21%. Frankfurt +0.13%. Futures at 5:30, Dow -0.29%. S&P -0.33%. Nasdaq -0.49%. Crude +0.02% to $52.65. Gold +0.01% to $1,314.30. Bitcoin +0.92% to $3,487. Ten-year Treasury Yield flat at 2.648%. Today is Cycle Day 3 (CD3)…Price is currently well below CD1 Low following prior session’s sell-down and testing prior low. Potential 3 Day Cycle Failure if bulls are unsuccessful recovery rally. 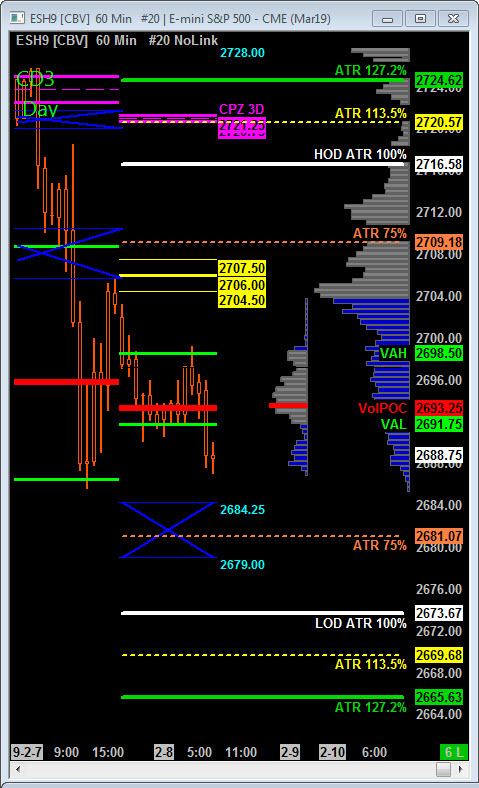 Scenario 1: IF price holds bid above 2695, THEN initial upside potential target measures 2704 – 2708 Central Pivot Zone. Scenario 2: IF price holds offer below 2695, THEN initial downside target measures 2684.25 – 2679.00 STATX Zone. Today is Cycle Day 3 …Price is currently well below CD1 Low following prior session’s sell-down and below prior low. Potential 3 Day Cycle Failure if bulls are unsuccessful recovery rally. Scenario 1: IF price holds bid above 6880, THEN initial upside potential targets 6900.50 – 6918.50 Central Pivot Zone. 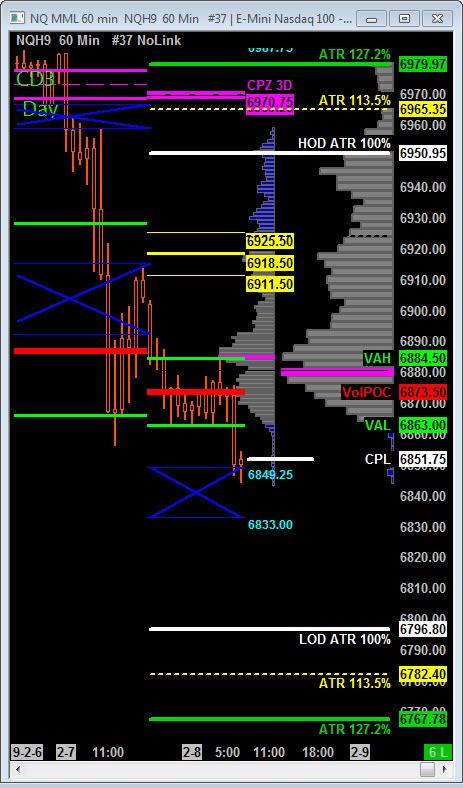 Scenario 2: IF price holds offer below 6880, THEN initial downside targets 6847.50 CD3 Range Low overlapping 6849.25 – 6833.00 STATX Zone.